I have a dilemma, and it involves pork. As I may have mentioned, a few years ago I discovered Flying Pigs Farm at Union Square market. Before then I never bought pork (ham and bacon excepted), but since I’ve become more than a little fond of the animal, largely encouraged by a pretty remarkable recipe for slow roasted shoulder. As I may also have mentioned, last November a real local butcher, Harlem Shambles, opened in our neighborhood. So I have a problem of fealty: where should I buy pork now? Rather than resolve this question just yet I’ve embraced this sudden begging supply of excellent pork and expanded my pork-cooking horizon further; I’ve been making pork chops. We’ve grilled them and, due to uncooperative weather gods, have seared them in a pan. Both work very well; key are the quality of the pork, and seasoning that respectfully complements the flavor of the meat. They were amazing, I thought. Whether here or there, another great reason to buy pork. Take the pork chops out of the refrigerator and prepare the rub at least 45 minutes before cooking. In a mortar, crush the fennel seeds with the sea salt. 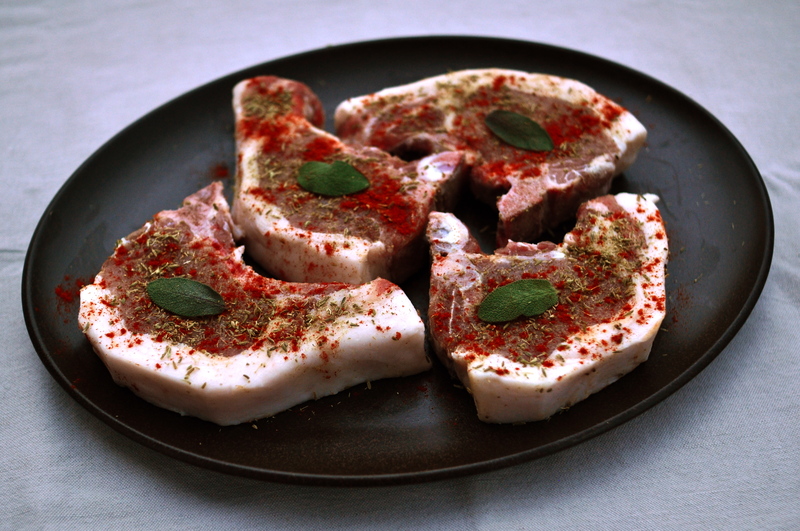 Just before cooking — on a grill or in a pan faintly coated with olive oil — sprinkle some smoked Spanish paprika on each side of the chops. Cook the chops over very high heat so they become beautifully brown on the outside without having time to dry up inside. It’s difficult to give an exact cooking time but it should be approximately 4 minutes on one side and 3 to 4 on the other. As always, let the meat rest in a warmish place 5 to 7 minutes before serving. The chops should be faintly pink inside and very juicy. This entry was posted on 13 September 2012 at 09:57 and is filed under Easy, Fall, Meat / Poultry, Spring, Summer, Winter, Year-round. You can follow any responses to this entry through the RSS 2.0 feed. You can skip to the end and leave a response. Pinging is currently not allowed. The snow-white fat cap on those chops looks amazing. Buying from a quality farm or butcher makes ALL the difference. Long live the noble pig.